CAMBRIDGE, Mass. 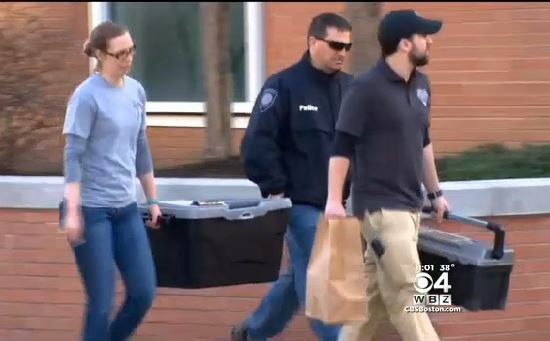 -- A suspect arrested after the discovery of human remains in a discarded duffel bag is due in court Monday, when authorities are expected to answer some of the questions that followed the discovery in a Cambridge neighborhood better known for technology research. The suspect, whose name hasn't been released, has been charged with being an accessory after the fact to assault and battery causing bodily injury and improper disposal of human remains. The bag was found Saturday morning outside a building used by biotechnology company Biogen Inc., and authorities said more remains were found across the street in a common area of an apartment building after surveillance video was reviewed. The location is less than two blocks from the Cambridge police station and near Kendall Square, a busy technology center not far from the Massachusetts Institute of Technology. CBS Boston reports police are investigating two separate areas; Loughery Way, a pedestrian-only walkway where the duffel bag was found, and an apartment complex on 6th Street where more human remains were found. Middlesex District Attorney Marian Ryan told CBS Boston the remains are believed to be those of one person, whose death is being treated as a homicide. The victim's name wasn't released. Authorities believe there is only one victim, but won't know for sure until an autopsy is complete. Jacquelyn Goddard, a spokeswoman for the prosecutor, said Sunday that more details about the case would be made public after the suspect appears in Cambridge District Court in Medford. Cambridge Police spokesman Jeremy Warnick referred questions about the investigation to the district attorney. He said officers went door-to-door in the apartment building Saturday night checking for any information or concerns residents had. "People shouldn't feel threatened, people shouldn't feel at risk, with a suspect in custody," he said.